Create more storage options in your home or office with the ClosetMaid 15-Cube Organizer. You can leave it freestanding or stack it with others for higher capacity. Customizable configuration allows you to meet your specific needs. Perfect for storing shoes, the organizer has a smooth, white finish that goes with the decor of every room in your home. Its assembled dimensions are 19 in. H x 25 in. W x 11-5/8 in. D.
The Honey-Can-Do 10-Shelf Canvas and Bamboo Shoe Organizer creates instant storage space as it protects and stores your favourite footwear. 2 steel hooks conveniently fit over your closet rod, so the organizer hangs vertically, maximizing space and giving you easy access. Great for holding handbags, accessories and other items, too. 24-Pocket Over-The-Door Closet Organizer, Black Polyester. Turn a jumbled mess into a well-kept closet with this 24 Pockets shoe and accessory organizer. Easily hangs over any traditional closet door to keep 12 pair of shoes organized, off the floor, and out of sight. Complete with hanging hooks, this versatile organizer can also be used to store jewelry, scarves, gloves, craft supplies, small toys or handheld electronics. Quickly find what you're looking for through the clear vinyl pouches. One item-inch Honey-Can-Do's mix and match collection of sturdy hanging organizers available in several colours, it's a perfect blend of economy and strength. Holds 12 Pair. Colour: Black with Clear Pockets. With stringent quality control methods, Honey-Can-Do confidently offers a limited lifetime warranty on every product they make. The 24-Pocket Bamboo Shoe Organizer has a slim design and is made of natural bamboo and canvas. Steel hooks conveniently attach to most doors, so the organizer hangs vertically, maximizing space. It warehouses up to 12 pairs of shoes; it can also be used to store jewelry, scarves, gloves, craft supplies, small toys, or handheld electronics. ClosetMaid 24 in. W x 19 in. 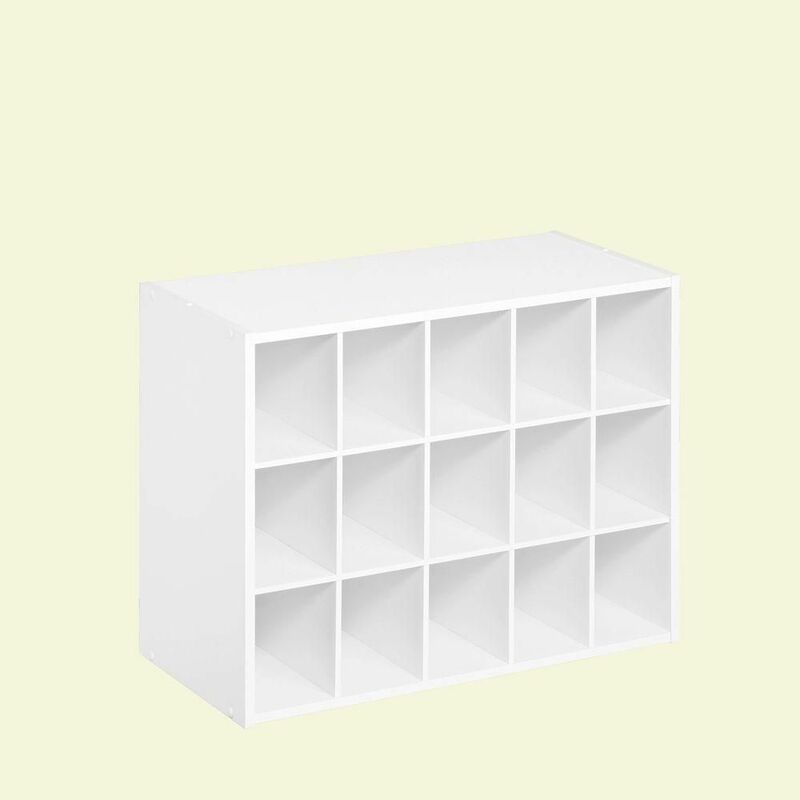 H White Laminate 15-Cube Organizer Create more storage options in your home or office with the ClosetMaid 15-Cube Organizer. You can leave it freestanding or stack it with others for higher capacity. Customizable configuration allows you to meet your specific needs. Perfect for storing shoes, the organizer has a smooth, white finish that goes with the decor of every room in your home. Its assembled dimensions are 19 in. H x 25 in. W x 11-5/8 in. D.
ClosetMaid 24 in. W x 19 in. H White Laminate 15-Cube Organizer is rated 4.0 out of 5 by 233. Rated 5 out of 5 by Noni from Ended up buying total of 3, stacked them, And now... Ended up buying total of 3, stacked them, And now I have a very neat and tidy and organized shoe storage.An absolute breeze to put together, solo, no man power. Directions were perfect and all predrllled holes aligned.Love it! Rated 3 out of 5 by Ozzieboy1 from Product materials seem inferior; prone to chipping and cracking. Very difficult to complete putti... Product materials seem inferior; prone to chipping and cracking. Very difficult to complete putting together without some type of damage. Otherwise size and dimensions were acceptable. Rated 1 out of 5 by Momshopper from The particle board cracked during assembly. Not very sturdy.... The particle board cracked during assembly. Not very sturdy.